Thursday November 24th, 2016 – Thanksgiving! Don’t be a TURKEY! Come get your sweat on before getting STUFFED! 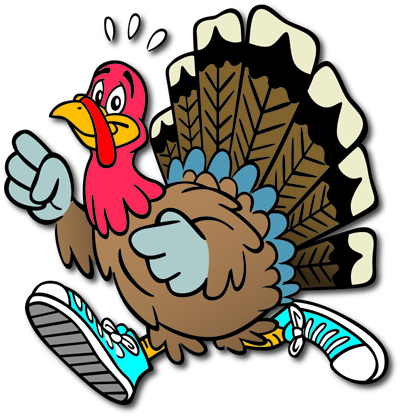 Reminder that classes are at 7:00am and 8:00am Thanksgiving Day. Open gym from 6:00am to 10:00am on Friday 11/25! Notes: Teams of four will be broken up into two teams of two. For part A, Partners 1 and 2 will start with an 800m run together. Partners 3 and 4 will accumulate as many Wall Balls as possible until Partners 1 and 2 get back from the run. At this point they will switch tasks. 3 and 4 will run 800m while 1 and 2 complete as many Wall Balls as possible. Once 3 and 4 get back from the run, the team moves on to Part B. The same format is used for all sections of the workout. Two scores: Time and Total reps.
*Complete each set “unbroken” (bounding) while only allowing yourself to rest between sets. Complete a set every 3 minutes. Use 1RM from 11/7/16. Complete one set of the complex every 2 minutes. Build to something that is heavy. Rest :30 between each round. Score = total power cleans completed.